Ray Liotta and Lauren Holly star in TURBULENCE, MGM's big spring action release. Liotta plays a crazed serial killer who commandeers a 747 headed to Los Angeles, while Holly plays a flight attendant who tries to pilot the craft through a series of thunderstorms. The visual effects for the film are quite good, with many fantastic aerial shots of the 747 flying through clouds and lightning. A great deal of actual air-to-air footage was captured by effects supervisor Mark Vargo. A few different setups were used when the crew shot actual 747s, including shooting a 747 from a Lear jet, as well as filming the craft from a B-25 bomber. Particularly successful is the greenscreen compositing of interior 747 shots, handled by Pacific Title Digital. Interiors were shot on a soundstage, while greenscreens were placed outside the craft, to later be replaced with an appropriate background, like clouds and sky footage. While characters were close to the camera, the windows of the plane, usually many feet away, were regularly out of focus. The mattes, however, are undetectable and the sky backgrounds are composited wonderfully into these shots. My favorite of these composites is a daylight shot of Liotta in the cockpit, when he finds the co-pilot dead. The cockpit windows take up 1/3 of the frame, and Liotta and an electrical wire pass in front of the windows--the composite is incredible and invisible. Pacific Title also handled some stormy backgrounds, scanning footage of actual lighting strikes, and manipulating them digitally to surround the 747. A lot of very nice touches were added to shots, including some fantastic reflections off of the 747 cockpit, as well as reflections on the CG 747 in wide shots. The synthetic aerial shots were also produced with realistic movement--accurate camera shake was used for many exterior shots of the 747. The only shots which do not feel this way are a few near the end, where an F-14 trails the 747. Some shots are a bit too steady and pretty. begins its approach to LAX, only to venture too close to the ground. garage in a fury of fire and explosions. Boss Film Studios built and shot an enormous 1/10th scale model of the 747 for use on a motion control stage. Because the model nearly filled the Boss stage, the Boss crew opted to shoot against a magenta screen, instead of traditional blue or greenscreen. This helped immensely when it came time for the matte passes, since blue or green spill would have posed a huge problem. A digital version of the 747 was created at Boss, as well. The model was digitized and modeled by Boss' Mark Rohdal and Jeff Smith, while Ruth Caspery, Elbert Yen, and Johnathan Banta created the textures. Caspery and Yen also created a CG version of the F-14 that appears at the climax of the film. The most interesting techniques used by Boss in the making of TURBULENCE was their technique for animating the passing clouds in frame. In the digital realm, a series of multiplane shots were created. Eight layers of painted clouds were animated in perspective as a separate layer. Attention to scaling, opacity and position allowed the digital Boss cloud unit, comprised of Johnathan Banta, Dean Boeke, Chris Bowers and Shine Fitzner, under the supervision of Wayne Vincenzi, to create stunningly realistic cloud effects. My favorite exterior 747 shot is the long shot of the landing gear coming down, near the end of the film. The terrific sequence continues as the low-flying craft flies near buildings (the 747's approach lights on the hotel were fantastic). 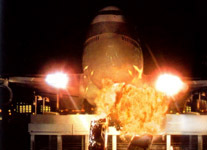 The plane smashes its landing gear into a parking garage and wreaks havoc on the building in a terrific sequence of pyrotechnics, miniatures and CG effects. My only complaint with the effects of the film was the sometimes noticeable grain pattern that appeared over the entire frame. The graininess of these shots, indicative of digital manipulation, made them stand out--especially when cut back to back with a clean, or non-manipulated shot. TURBULENCE is a bad--sometimes offensively bad--film. A much better film that took place in the air was last year's EXECUTIVE DECISION, directed by Stuart Baird, which was produced with a serious attempt at creating drama and suspense. TURBULENCE has a cookie-cutter, TV-movie script and wastes the talent of Ray Liotta, who is far too good for this material. The film was actually supposed to be released last fall, but was delayed, primarily because of the real-life tragedy of the TWA crash last year.